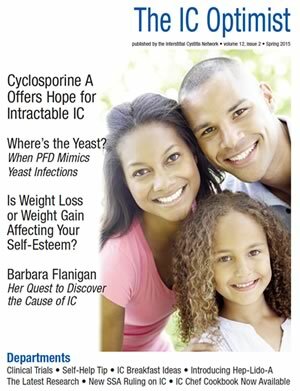 (1) Editorial: Cyclosporine Offers Hope for Intractable IC- If there’s one therapy that doctors are reluctant to discuss, it’s cyclosporine. When used in high doses to prevent organ rejection, it can cause serious and potentially fatal side effects. In low doses, however, it is used to treat a variety of autoimmune disorders, including IC. This article shares the latest research and what you should know about this Step Five treatment option. (2) Feature Story: Where’s The Yeast? When Pelvic Floor Dysfunction Mimics Yeast Infections- If you’re like many patients, you’ve probably struggled with a variety of odd, unusual symptoms. 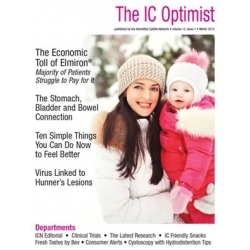 Some women struggle with vaginal irritation which they believe are recurring yeast infections. Physical therapist Allison Romero explains just how and why pelvic floor muscles can cause these symptoms. No wonder Monistat never seemed to work!! (3)The Latest Research: Treating IC and Pelvic Pain with Acupuncture- Don’t roll your eyes just yet. Yes, many do wonder how sticking needles into the skin could help reduce IC symptoms and pelvic pain but, believe it or not, it does seem to help some patients. We share the latest research and info on how you can participate in a clinical trial to see if it could control and reduce your symptoms. (4) Feature Story: Is Weight Loss or Weight Gain Affecting Your Self-Esteem?- Earlier this year we learned that weight gain (and weight loss) is a huge frustration for patients with IC. IC writer Stacey Shannon shares several patient stories and the three common causes of weight gain (medication, carbo cravings, exercise), as well as the struggles of patients who stop eating to reduce bladder pain. There is hope my friends! You are not alone. (5) SelfHelp Tip: How Much Sugar Do You Eat Each Day— If you order one Venti Frappuccino from Starbucks, you’ll be consuming 99 grams of sugar. That’s the equivalent of 25 teaspoons and almost 1/4 of a pound of sugar in just one drink! In the 1800’s, Americans ate about 2 pounds of sugar a year. Today, it’s 3 pounds a week and the clear cause of the rising level of obesity around the world. Sugar is also linked to inflammation in the body. We share why you should be angry and how you can break the cycle. (6) SSA Offers New Ruling on Interstitial Cystitis:- Earlier this Spring, the Social Security Administration issued new guidelines on IC. We share the details and what you can do to strengthen your application for benefits. 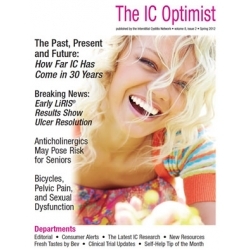 (7) Clinical Trial News - Many believe that Rejuvenative Medicine is the future of health care. How? By stimulating the body to heal naturally through the use of adipose derived (from fat) stem cells. The California Stem Cell Treatment Center seeks participants for their IC study. (8) The Latest Research: Hep-Lido-A Significantly Reduced Bladder Pain and Urgency - Rescue instillations are the most popular bladder instillation therapy to date. Hep-Lido-A (aka Parson’s IC Solution and Vesicyst) is a prepackaged formula that makes it easier for both patients and providers to use. Research studies continue to show that this formula can reduce pain and discomfort for many patients. 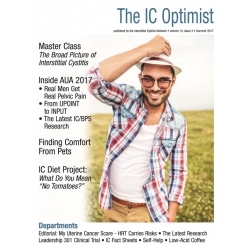 (9) Feature Article: Compounded Medication Coverage Can Be Challenging- If you’ve struggled to have your insurance pay for compounded medications like vaginal valium or Hep-Lido-A, Adrienne Resek shares how you can appeal those decisions. Persistence does pay off. (10) Patient Story: Barbara Flanigan - My Quest To Discover The Cause of IC If there is an unsung hero in the IC movement it’s Barbara Flanigan. Not only did she start the first ICA of America here in California, she’s also dedicated the last thirty years to discovering the cause of IC. She shares the earliest history of the IC movement and the challenges they faced in getting the National Institutes of Health to study IC. She also shares, in depth, why she thinks a rare Vitamin B12 deficiency and porphyria are the root cause of IC. It’s only her theory but it’s well worth our consideration. (11) IC Diet: IC Breakfast Ideas - IC patient Angela Atkins not only loves breakfast, she loves brinner (breakfast foods served at dinner). She shares some great tips and suggestions to start the day with a healthy, filling meal that won’t irritate the bladder.